The Crop Circlers are a nomadic tribe, constantly moving in a great sweeping arc from Avalonia to the Wiltshire Downs and Salisbury Plain – and back again. 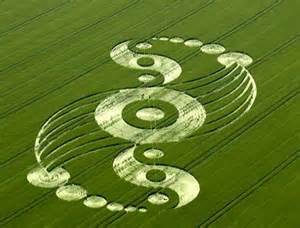 According to tribal lore they must continue to make this endless circling journey, renewing the energies of the land, or else the crops will fail. There is little or no crime amongst the Crop Circlers, though a local anthropologist who studies their intensely nomadic habits puts this down to sheer exhaustion. The only recorded crimes were committed by a cereal killer from the Root Crop Clan, whose members have in any case always had a somewhat muddy reputation. Sightings of the Crop Circlers – who seem to pop up overnight out of nowhere – are more common during the summer months. Periodically they gather at tribal meeting places – or moot points – to hold what are called “Cornferences”. Very little is known about these apart from the fact that discussions occur on tricky questions – or moot points.